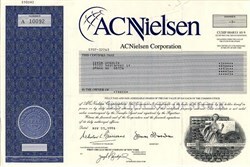 Beautiful uncancelled certificate from the AC Nielsen Corporation issued in 1996. 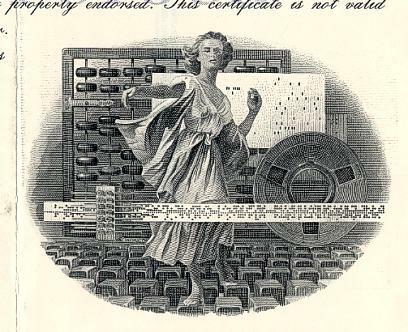 This historic document was printed by American Banknote Company and has an ornate border around it with a vignette of an allegorical woman on a computer keyboard. This item has the signatures of the Company's Chairman and Secretary and is over 27 years old. Small crease on top. ACNielsen is a global marketing research firm, with worldwide headquarters in New York City, United States of America. Regional headquarters for North America are located in the Chicago suburb of Schaumburg, Illinois. As of May 2010, it is part of The Nielsen Company. This company was founded in 1923 in Chicago, by Arthur C. Nielsen, Sr., in order to give marketers reliable and objective information on the impact of marketing and sales programs. ACNielsen began expanding internationally in 1939, and now operates in more than 100 countries.